George Divoky has studied seabirds in arctic Alaska since 1970 when, as a researcher at the Smithsonian Institution, he participated in the Coast Guard’s survey of the Arctic Ocean adjacent to Prudhoe Bay. Since then he has been involved in Alaskan seabird research relating to a diverse group of conservation issues including the Alaska Native Land Claims Settlement Act, oil and gas exploration of the outer continental shelf, the Exxon Valdez oil spill, and regional climate change. Since 1975 he has maintained a continuing study of Black Guillemots on Cooper Island, Alaska, that is one of the longest longitudinal bird studies in the Arctic. The Cooper Island study’s findings on the consequences of recent snow and sea ice reductions provide some of the best examples of the biological consequences of climate change. Dr. Divoky’s research was featured in a cover story in the New York Times Magazine entitled “George Divoky’s Planet,” in the PBS’s Scientific American Frontiers program “Hot Times in Alaska,” and on ABC Nightly News and Nightline. He has appeared on The Late Show with David Letterman, been interviewed NPR’s Talk of the Nation and Science Friday, and his story and findings were featured in a play about climate change, Greenland, staged by the Royal National Theatre in London in 2011. He helped found and has twice been chair of the Pacific Seabird Group, an international organization working to advance conservation and research of Pacific Basin seabirds. 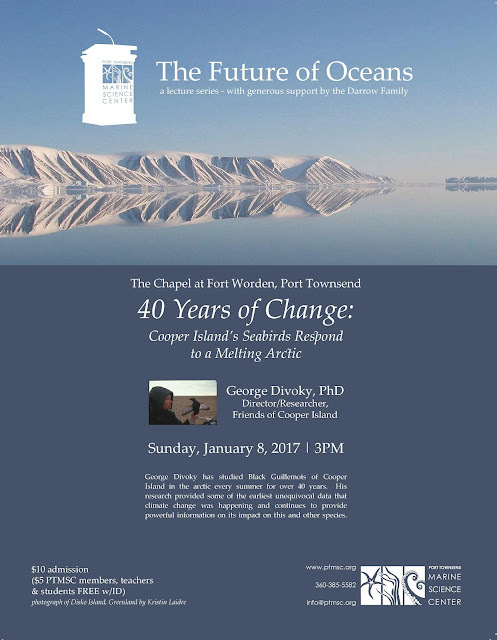 Currently, as Director of the nonprofit Friends of Cooper Island, he is working to ensure the continuation of research on Cooper Island seabirds in coming decades when they will have to deal with the complete disappearance of summer ice, offshore drilling, increased shipping and commercial fishing. Divoky was born and raised in Cleveland, Ohio, has Bachelor’s and Master’s degrees from Michigan State University and a doctorate from the University of Alaska Fairbanks. When not in the field he lives in Seattle, Washington.